I have been making some excellent progress with this project. I have now signed up 12 ‘models’ from my Rotary Club. I will be scheduling sittings in my home studio in four/five afternoon sessions over the next four weeks. I hope to finalise the schedule by the end of next week. I really only need 10 models so I have some contingency for drop outs. One issue is that many of them wear glasses which might make managing reflections awkward. For lighting I am using available light with a small torch aimed at the back of the head to give better separation from the background. So managing reflections will be possible. I may also decide to ask them to remove them if they can see either at short range or at a distance. I will try to fit the poses to their eyesight. I have now constructed my home made headstand. 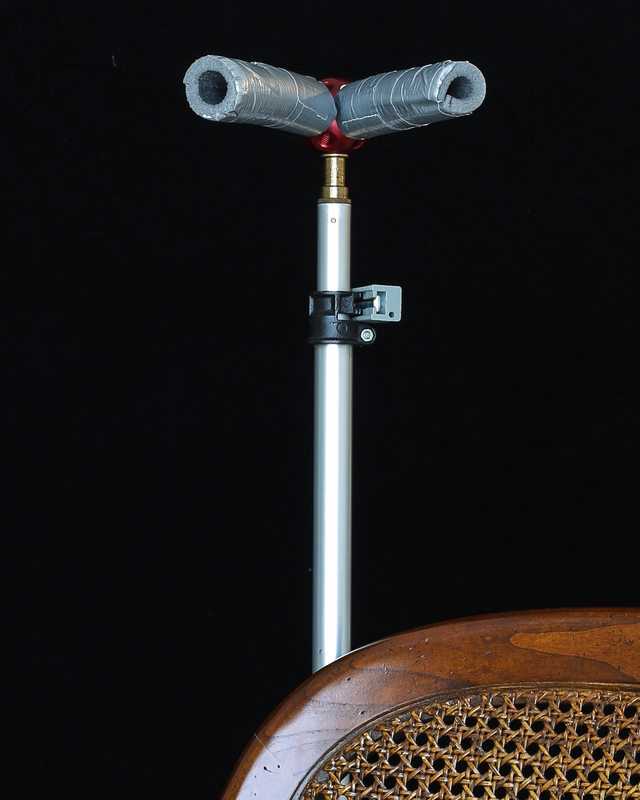 It is made from a Manfrotto Dado mount with two rods attached in a V shape. Each rod is covered in some pipe insulation tubing. It seems to work well, enabling the sitter to keep their head in the same place. This is a diptych of portraits of my wife made up of two images each with a 48 second exposure. 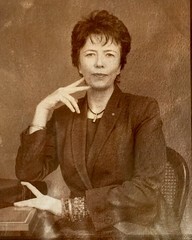 I asked Glynne to relax in between the two portraits and then to resume the pose. Her head is supported by the headstand which is shown in the picture below the diptych. I have also decided to work both in digital with my Canon 5D mk 3 (chosen because it is much quicker at processing files following a long exposure) and on 4×5 sheet film with my Ebony view camera. I hope that the film images will prove to be useable. I don’t have a lot of experience using this camera and there are many things to remember (or more to the point forget). The view camera references the early days of photography and so is very appropriate (if a little risky) for this project. I have ordered 60 sheets of Kodak Portra 160….at a cost of £240!!! Finally I have decided upon a dress code. My Rotary colleagues will be asked to dress in slacks and a plain shirt. I will then supply them with a dark grey v necked sweater to wear over their shirt. The result will be that they will all appear to be dressed in the same way. This will avoid the viewer spending too much time looking at how they are dressed and focus on what I really want them to look at, which is comparing the gazes in the two portraits. This is a technique I picked up from looking at Bettina Von Zwehl’s work. I am very hopeful now about this project. It also seems to fit well with some of my other work which will show continuity in my work throughout the Advanced module. I am sure that your film images will be, not only usable, but even better that the digital ones!!! Yes I hope so but as I have to complete this work for my studies I am hedging my bets with the digital. I guess others might have used polaroids and such like in a studio set up. Do your subjects need to see to look towards the lens? I’m going to be interested to see how much personality shows through despite the ‘uniform’. Are you going to be dressed in the same way? Thanks for the feedback Catherine. I am basing the direction of the gaze and the physical orientation of the subjects on the range of poses in the David Octavius Hill portraits. So in this sense I am emulating the early portraits which Walter Benjamin refers to in ‘The Short History of Photography’. The gazes will be either towards the viewer/camera, reading a book, looking out beyond the viewer, or looking to the left/right. The orientation of the bodies will either be frontal, 3/4 view or profile. I have constructed 10 variations of these based on the DAH portraits. 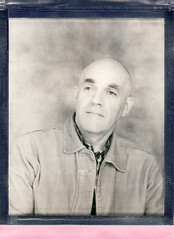 I am probably not going to appear in this series personally as I want it to be just portraits and not self portraits. But I will be in lots of test photographs! Yes it will be interesting to see how viewers read the subjects personalities with just the body language from the waist up and the facial expressions to work with, i.e. no background, no props, no individual clothing. 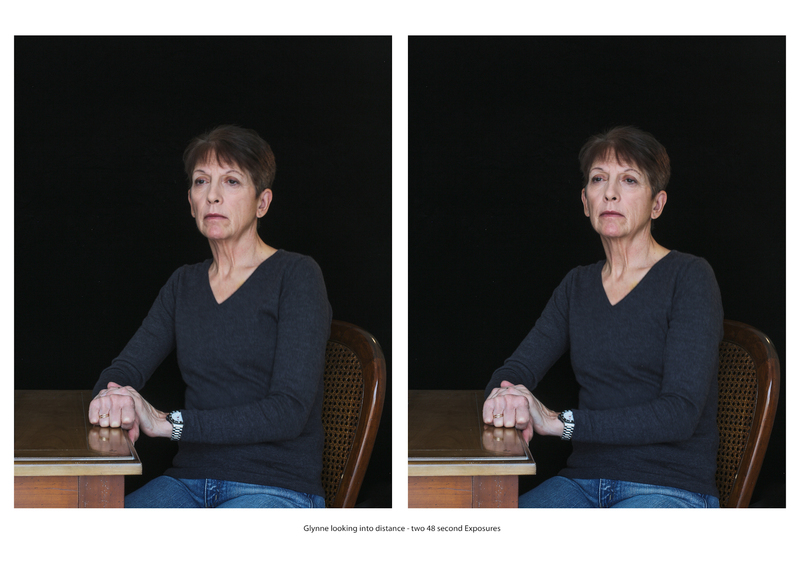 I’m also extremely interested to see whether the viewer’s perception of the sitter is the same for each of the portraits in the diptychs…in other words whether using long exposures really does result in ‘expressive coherence’.